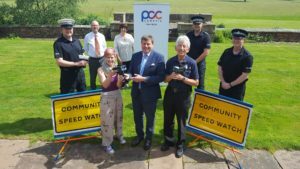 Cumbria’s Police and Crime Commissioner, Peter McCall, has provided approximately £10,000 funding to purchase three speed laser devices for use by local communities to tackle speeding vehicles in their areas. Speaking of his support for the scheme, Peter McCall said: “My mantra is ‘we, not they’, which is why I am delighted to fund the purchase of the three new Speed-Watch radar-guns so that volunteers from the local communities are empowered to help reduce anti-social driving and improve safety in their local area. “A significant part of my role involves listening to the views, concerns and issues from people in Cumbria, and ascertaining what their priorities for the police are. One subject that comes up frequently is speeding, along with anti-social driving, parking issues and road-safety in general. I believe this is equally an issue on our main roads, as well as for drivers in the many rural communities in Cumbria, which is why I believe the Speed-Watch schemes are so important.